Former Trinidad and Tobago player David Nakhid will lodge an appeal on Friday against Fifa's decision to disqualify him as a presidential candidate. His legal team will present their case at the Court of Arbitration for Sport (Cas), stating there was a violation of Fifa's electoral regulations. 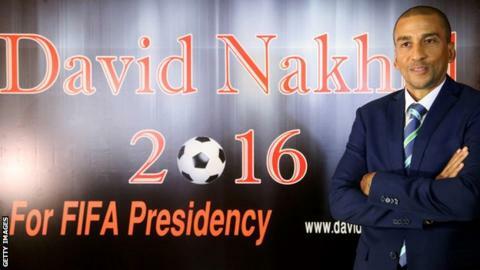 Nakhid's candidacy was invalidated because he only received four valid football association nominations and presidential candidates require five. The Fifa election is on 26 February. It is understood one national association nominated both Nakhid and another candidate. Under the election rules that would invalidate the nomination. Cas is expected to give its decision within a few weeks. Football's governing body has declared five candidates eligible to run: Prince Ali Al Hussein, Sheikh Salman Bin Ebrahim Al Khalifa, Jerome Champagne, Gianni Infantino and Tokyo Sexwale. The candidacy of Michel Platini will be considered once his 90-day suspension by Fifa's ethics committee is over.